Dental implants are an increasingly popular option for patients who have lost one or more of their natural teeth. Teeth may be lost through decay, gum disease, injury or accident. Whatever the reason, losing your teeth is an upsetting business, and can cause you to become embarrassed about smiling or laughing in public. Missing teeth can also cause further dental and general health problems. Any remaining teeth may attempt to move into the gaps, becoming misaligned or crooked and difficult to clean, which can lead to further decay. Especially if you have lost several teeth, your speech and ability to eat may be affected, with healthy options such as hard fruit or nuts suddenly off the menu. This can have serious implications for your overall health. Over time, the bone beneath gaps left by missing teeth starts to resorb, leading to a sunken appearance of the face. There are many solutions for missing teeth, including bridges and unsecured dentures, and the best options for your individual needs will be discussed at your initial consultation. One huge advantage dental implants have over other solutions is that they integrate with your jawbone, supporting bone growth and preventing the problem of resorbtion. Dental implants are small titanium screws placed directly in the jawbone, acting as artificial tooth roots. They integrate with the bone over time, providing a firm anchor for replacement teeth in the form of crowns, fixed dentures or bridges. 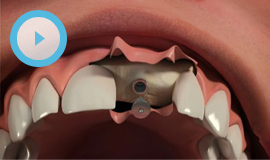 Placing dental implants requires a minor surgical procedure carried out here at the practice. In most cases this requires just a local anaesthetic, and many patients report it is less traumatic than having a tooth removed. For patients who have been wearing dentures or have had missing teeth for some time, we also offer bone graft and sinus lift procedures, which help to rebuild the bone so that dental implants can be placed. We accept referrals from local dentists for implant placement, bone grafts and sinus lifts – please speak to your dentist if you are interested in being referred to us for implants.